The Great Patents Heist. John Nugent. 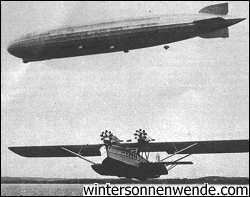 German aircraft designer and manufacturer Claudius Dornier's Super Whale (shown below a 1920s Zeppelin). First built in 1926, it proved an important milestone in the development of flying boats, and it pioneered regular flight between Europe and South America. Germany's motor, jet and rocket aerial creativity from early in the century until 1945 was considered remarkable. Few realize that at the end of World War I, after some 1,000 days of combat, Germany's 35 aircraft manufacturers and 20 aero-engine plants had 18,500 planes in inventory. The Versailles Treaty forced severe curtailment of German aviation. The nations of the Inter-Allied Control commission took their pick of advanced German planes and technology, while destroying all remaining military aircraft. Engelmann cites endless lists of great Jewish MDs of German or Austrian domicile, several of whom, such as bacteriologists Paul Ehrlich (1854-1915) and Robert Koch (1843-1910), won the Nobel Prize in medicine and physiology (Ehrlich, 1908; Koch, 1905). [Scriptorium comments: Robert Koch was not Jewish.] Sigmund Freud (1856-1939), of dubious credentials, is one of Engelmann's prize examples. Engelmann also slays entire forests with pages of printed paeans to forgotten Jewish playwrights, songsters, operetta producers, critics, publishers etc. How could one forget the immortal Meyerbeer? To the wary eye, it smacks of ethnic self-congratulation. One gifted Jew writes a piece, another publishes it, yet another reviews it favorably, a fourth sits at the box office counting out his money and a fifth takes his 10 percent as agent - an unconvincing proof that the nation of Mozart, Bach and Beethoven needed music lessons. Gottlieb Daimler (1834-1900) and Karl Benz (1844-1929) invented the modern gasoline engine in 1878-1887. Other Germans took the lead in 19th-century chemistry and created the first contact lens (in the 1880s), X-rays (Wilhelm Roentgen in 1895), quantum physics (discovered in 1900 by Max Planck, 1858-1947), aspirin (acetylsalicylic acid) and last (and least), saccharin in 1913. As for previous centuries, the Germans got no credit for inventing the croissant or "Kipferl," as the Germans call it, in Vienna to celebrate defeating the Turks in 1683; one notes the Turkish religious logo, the crescent (a baked good then snatched up by the French as the "croissant"). Equally, they receive zero credit for baking the first quiche, which in Lorraine and Rhinelander dialects ("Kiisch") simply means "kitchen leftovers baked into a pie." An astounding admission of the stripping of German inventiveness after the war came in an October 1946 article by C. Lester Walker in Harper's magazine. Entitled "Secrets by the Thousands,"*** it presents some problems for the Bernt Engelmanns of this world who imply that German science in the 1932-45 period would have been "nothing without the Jews." In fact, the article suggests in deadly seriousness that German Chancellor Adolf Hitler had been right, from his point of view, to prolong the war to the last gasp. According to the deputy commanding general of Army Air Forces Intelligence, Air Technical Service Command, in a speech to the American Society of Aeronautical Engineers, "The Germans were preparing rocket surprises for the whole world in general and England in particular which would have, it is believed, changed the course of the war if the invasion had been postponed for so short a time as half a year." Today, Hermann Oberth (white smock, center) is virtually forgotten outside related scientific circles, although he pioneered Germany's (and therefore the world's) space flight movement. This photo was taken in Berlin on July 23, 1930, just before Oberth demonstrated his rocket engine. 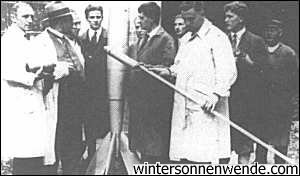 To the left of the rocket is 18-year-old Wernher von Braun. He would be central to Germany's World War II ballistic missile development at Peenemünde, a remote coastal island in the Baltic Sea. During the Third Reich's earlier years, rocket technology was centered at Kummersdorf. Hitler visited that complex in September 1933, and it prompted him to grant the scientists more resources than they had expected. Even without its brilliant Jewish minority, the Germans' "V-2 rocket which bombed London was just a toy compared to what the Germans had up their sleeve." They had 138 types of guided missiles in various stages of production or development, using every kind of remote control device or fuse: radio, radar, wire-guided, continuous wave, acoustics, infrared, light beams and magnetism. And for power the Germans were years ahead in jet propulsion at both subsonic and supersonic speeds - even creating a "jet helicopter" wherein tiny jets spun the helicopter blade tips at blinding speeds. Technicians work on improving rocket technology in an underground factory. Another rocket in the works was the A-9, still bigger at 29,000 pounds and equipped with wings. It had a range of 3,000 miles. Manufactured at Peenemünde, it arced into the sky at an incredible 5,870 miles per hour. But most Americans know about German World War II rockets. A few even know that in addition to the car engine the Germans also invented the jet and perfected the superhighway or autobahn (the three most important inventions binding this vast country [i.e. America; Scriptorium ed.] together). Virtually no one knows that in Wright-Patterson Field in Ohio, in the Library of Congress and in the Department of Commerce in Washington, a "mother lode" of 1,500 tons of German patents and research papers were being mined furiously after the war. One gloating Washington bureaucrat called it "the greatest single source of this type of material in the world, the first orderly exploitation of an entire country's brain power." ...[p]ulling some brown, papery-looking ribbon off a spool. It was a quarter-inch wide, with a dull side and a shiny side. "That's Magnetophone tape," he said.3 "It's plastic, metallized on one side with ferrous oxide. In Germany, that supplanted phonograph recordings. A day's radio program can be magnetized on one reel. [Then] you can demagnetize it, wipe it off, and put on a new program at any time. No needle, no noise or record wear. An hour-long reel costs 50 cents." When not gunning down a surrendering German mayor armed only with a white flag (as he boasted in a Der Spiegel interview) or bribing British officers to invent his heroic war record (for which war record Montgomery personally pinned a medal on him), Maxwell/Hoch8 was in the British Zone of Berlin in 1946 with the full backing of British intelligence, coercing the vast research findings of the Springer science publishing house from Springer's widow for pence on the pound. As just one example, munitions minister Albert Speer pleaded with Heisenberg and his fellow conspirator von Weizsäcker (brother of a later West German president) to name whatever money or materials they required after they claimed they had been held up by shortages. Von Weizsäcker's reply asking for "40,000 marks" caused Speer to stare in amazement, and to later confess that he had himself planned to propose 100 million marks for starters. Not only did Heisenberg state explicitly to Der Spiegel, "We never tried to produce any atomic bombs and we are glad not to be responsible for having made any," he also admitted leaking the latest information on German uranium-splitting research to the half-Jewish Danish scientist Niels Bohr, who promptly informed his racial confreres in the U.S.
Gen. Alfred Jodl, Wehrmacht chief of staff (center with pen) representing post-Hitler head of state Adm. Karl Dönitz, signs unconditional surrender documents at Rheims, France on May 7, 1945. On that date the submarine U-234 was en route to Japan with 12 cylinders containing microfilm material on Germany's most advanced weaponry, including advanced atomic research. In fact, Germany was capable of producing an A-bomb. On May 17 Adm. Dönitz ordered the U-boat's captain to surrender to the U.S. Navy without destroying its top-secret cargo. One of Gen. Remer's most interesting assertions is that just as the Americans were racing in the final days to convert German inventions for use against Japan, Hitler was sending a U-boat packed with secrets to that same nation at Emperor Hirohito's explicit request. 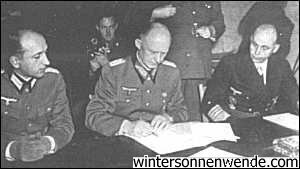 Our orders stated that we were to bring air force Gen. Kessler as a Luftwaffe attaché with his staff and technicians to Tokyo. The [emperor] had asked us to help build up Japan's air defenses with the weapons developed in Germany. Also on board to this end were, besides the general, two air force officers, a navy anti-aircraft specialist, an underwater demolitions specialist, a low-frequency specialist from the staff of Prof. Küpfmüller as well as two Messerschmitt engineers (specialists for the construction of Me-262s)13 and two Japanese frigate captains. One of them was [a] Capt. Tomonaga, who had collaborated with us in his capacity as a specialist for one-man torpedoes14 when we were developing our own small combat boats. After passing through the Straits of Iceland and 28 days submerged at an average depth of 260 feet, a message reached us in the night of the 12th to the 13th of May15 during snorkel travel, in which Grand Admiral [Karl] Dönitz ordered us to capitulate. At this point in time we were located in the middle of the Atlantic, southeast of the banks of Newfoundland. The order to our captain was couched in a very personal tone, telling him to hand the U-boat over without destroying its valuable cargo.16 After 12 hours of debate and reflection, Capt. Fehler decided in harmony with Gen. Kessler and after informing the two Japanese frigate captains that he would be carrying out Dönitz's order and surface to surrender. The two Japanese officers took their own lives before the boat surfaced. A December 1947 photo of a captured German A-4/V-2 rocket being prepared for launch during the early stages of the U.S. guided missile program. The author notes that just two years after the seizure of some 50 tons of German aerospace and physics papers by the United States (including highly advanced work regarding spacecraft), an alleged UFO incident occurred near Roswell, New Mexico. It is at least interesting that it was just two years after the seizure of "50 tons"19 of German aerospace and physics papers that the first major UFO story, the 1947 Roswell, New Mexico incident, broke. After all, what has fascinated researchers ever since (particularly government skeptics monitoring Area 51 at Groom Lake, north of Las Vegas) is things the Germans were working on: spacecraft which use new, tough, but lightweight materials, make 180 degree turns at Mach 4 without spilling the drinks and generally defy the laws of gravity, perhaps by the use of gyroscopes within gyroscopes. One of the most interesting sources of information is Tom Mahood's website at http://www.sky.net/~wings/groom.htm [Scriptorium notes: this page no longer exists - try here instead], featuring photographs of Area 51, including the very serious orange border sign, pictures and information on the round-trip Vegas-to-Groom Lake air service "Janet," as well as photos taken of the MII-60 "Pave Hawk" all-weather helicopter which patrols Area 51, and information on the hush-hush security service EG&G Corporation in Las Vegas, and even a newsletter on Groom Lake by singer Glen Campbell. What's going on? It is well known that the German SS sent expeditions to Tibet, reputedly a land of mind-over-matter marvels - in the late 1930s.20 The purpose was both to delve into evidence of Indo-European origins in the Himalayas and secret techniques used there, possibly including anti-gravity levitation. What ties this together with Europe, ancient America and Egypt is the finding of blond mummies or Nordic remains in or near many sites of architectural miracles. As any reader of the three articles on Egypt in the September-October 1998 issue of TBR, or anyone who has seen the excellent programs on Egypt on the cable History Channel, can testify, both the people living in ancient Egypt and the rulers of Macchu Picchu were doing virtually gravity-defying feats in constructing their pyramids and temples. Just three days after the end of World War II, German soldiers dig earth shelters at Dallien in the U.S. zone. As cold weather set in, these shelters (and food supplies) proved inadequate, with a death rate of 30 percent per year. 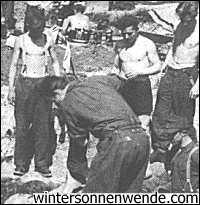 Concerning the fate of German prisoners of war, it should be noted that more German soldiers died or were murdered while in Soviet captivity than were killed or wounded on the Western front from D-Day to the May 7, 1945 surrender. Hundreds of thousands of Germans soldiers and civilians suffered the same fate in Yugoslavia, Czechoslovakia and Poland. ** And in the French sector, 40,000 German POWs were coerced into joining the French Foreign Legion. Ironically, these veterans again found themselves facing a communist-inspired adversary as most were sent to French Indochina (Vietnam) to fight against the Vietminh insurgents seeking to "free" the region from French colonial rule. By 1944, the western Allied "Operation Paper Clip" was under way, named after the clips on the file cards of German scientists. Those engaged hunted "living science," and also pursued German patents and business secrets. They finally succeeded in stealing both. 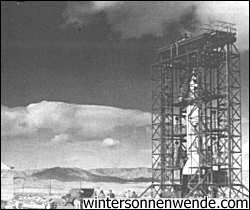 According to a statement released by the U.S. Department of Defense in February 1950, 24,000 German scientists and technicians were "questioned in detail," and 523 of them were "brought into the U.S.A." Of these, 362 were "requested" to take steps for the acquisition of U.S. citizenship. These German scientists, according to the manager of Operation Paper Clip, "saved at least $1 billion in weapons expenditures and at least 10 years in development time already by May 1949." Although the Americans were the initiators of the intellectual plundering of Germany, it was practiced by all the victors - the United Kingdom, France and the Soviet Union. When World War II came to an end, the experts of the French, the Soviets and the British were just as ready as the Office of Technical Services in Washington (OTS). The London office of the British Intelligence Objectives Subcommittee said proudly, "The production secrets we take away from Germany are a bigger blow than the loss of East Prussia." Even the prime minister of Australia, Joseph B. Chifley, admitted in a radio address in September 1949 that "the booty of 6,000 German industrial reports and of 46 German scientists given to Australia" possessed a value that could not be calculated in money and now enabled Australian producers to also play a prominent role in industrial world production. This booty was so great that very soon one was unable to count the documents, and they were measured by weight of paper. The U.S. Air Research and Development Command at Wright-Patterson Air Force Base in Ohio in this way received "without doubt the greatest collection of captured secret methods in the world," and it weighed 1,554 tons. 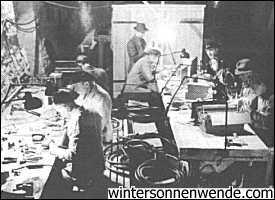 An official of the OTS called this office with the mission to distribute the techno-scientific progress of Germany "the first organization in the world with the purpose to bleed dry the inventive power of an entire people." It disposed of more than 3,000 tons of documents seized in Germany. So that nobody could come along and denounce all this wholesale robbery and plunder as a war crime, it had to be arranged that all Germans of those times would be continuously defamed and treated as criminals, barbarians, "war criminals," "militarists," "fascists" (with the propaganda-meaning of satanic evil) - so that none of these undesirable people who might hold such opinions should occupy any position from which the public could be reached. That is the reason for Allied control officers at German universities, for Allied writers or assistants in the rewriting of German historical textbooks, and for as many as possible foreign lecturers for history and political sciences at German universities. And while the certainly not timid Nazis had removed 1,628 university teachers (with pensions), the anti-Nazis in 1945 victimized no less than 4,289 professors and teachers. And they did not receive any pensions. As Christ und Welt calculated in 1950, the Nazis removed 9.5 percent of the university personnel. The Allies removed 32.1 percent.